Navigational and hydrographic overview «Navigation on the Dnipro River. Kyivske Reservoir, Dnipro River from Loiev to Kamaryn, Prypiat River from Usivske Reach to Chornobyl» is first edition which contains charts and related texts covering the Kyivske Reservoir, Dnipro and Prypiat Rivers. The offered edition gives only general overview on navigation conditions within this section of the Dnipro and that is why cannot be used as official guidance for navigation. The overview consists of the pilot providing physical and geographical, climatic and hydrological characteristics of the Kyivske Reservoir, describing navigational and hydrographic sailing conditions. It contains also 13 chart sheets at a scale of 1:100 000 and 1:50 000 in WGS-84 including the insert of the Kyivska Hydroelectric Power Station Out-port at a scale of 1:25 000, scheme of yacht-clubs location, chart symbols and signal beacons regulating navigation on inner waterways, navigation rules on the Kyivske Reservoir, pictures of aids to navigation and river sceneries. For convenience the pilot is compiled in upstream direction from the Kyivskyi Lock. Kilometres are counted in the same direction along a navigable waterway. Chart sheets are arranged in downstream direction due to chart projection and the direction of river flow relative to chart frames. Bridges are charted from the Upper Dnipro. 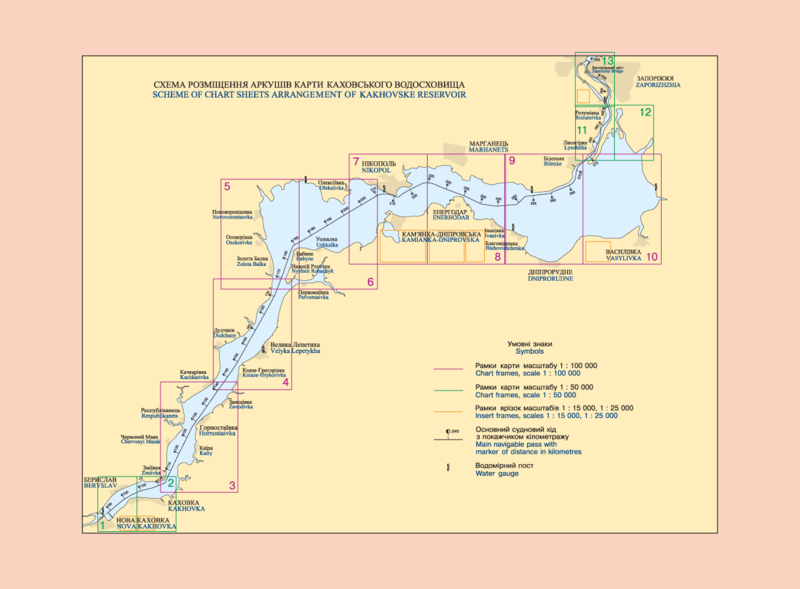 The detailed information on navigation conditions, current updating can be found in official navigational charts of the Dnipro River and publication «Dnipro River Pilot» issued by the State Hydrographic Service of Ukraine. Navigational and hydrographic overview may be used by navigators in order to study navigation conditions and set a route. The overview may be useful as well for yachtsmen, navigators of small craft, fishermen, tourists and organizations dealing with resources of the Dnipro River. This book is a first edition which includes cartographic and textual information about Kanivske Reservoir. It gives general overview on navigation conditions within this section of the Dnipro River and that is why cannot be used as official guidance for navigation. 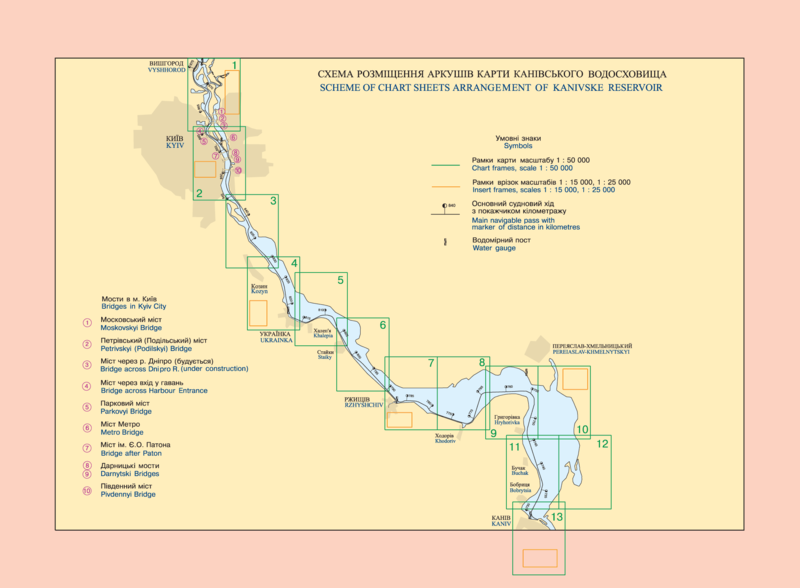 This overview includes the pilot providing physical and geographical, climatic and hydrological characteristics of the Kanivske Reservoir, describing navigational and hydrographic sailing conditions. 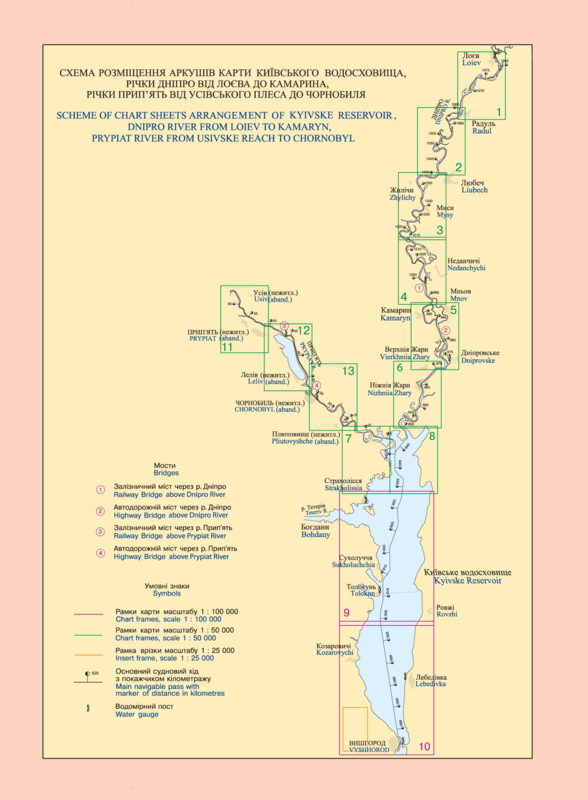 It also contains 13 chart sheets at a scale of 1:50 000 in WGS-84 including inserts of larger scales, scheme of yacht-clubs and fuel stations location, chart symbols and signal beacons regulating navigation on inner waterways, navigation rules on Kanivske Reservoir, pictures of aids to navigation and river sceneries. This navigational and hydrographic overview will get acquainted navigators with navigation conditions and will help them to determine a navigation route. It will be useful for yachtsmen, navigators of small craft, fishermen, tourists and organizations dealing with resources of the Dnipro River. This book is a first edition which contains charts and related texts covering the section of the Kremenchutske Reservoir. It gives only general overview on navigation conditions within this section of the Dnipro River and that is why cannot be used as official guidance for navigation. This overview includes the pilot providing physical and geographical, climatic and hydrological characteristics of the Kremenchutske Reservoir, description of navigational and hydrographic sailing conditions. It also contains 11 chart sheets at scales of 1:50 000 and 1:100 000 in WGS-84 supplemented with large-scale inserts, scheme of yacht-clubs and fuel stations location, chart symbols and signal beacons regulating navigation on inner waterways, navigation rules on Kremenchutske Reservoir, photo illustrations of aids to navigation and river sceneries. For the user’s convenience this publication is compiled in upstream direction from the Kremenchutskyi Lock to Kanivskyi Lock. Kilometres are counted in the same direction along a navigable waterway. Chart sheets are arranged in downstream direction due to chart projection and the direction of river flow relative to chart frames. Navigational and Hydrographic Overview “Navigation on the Dnipro River. 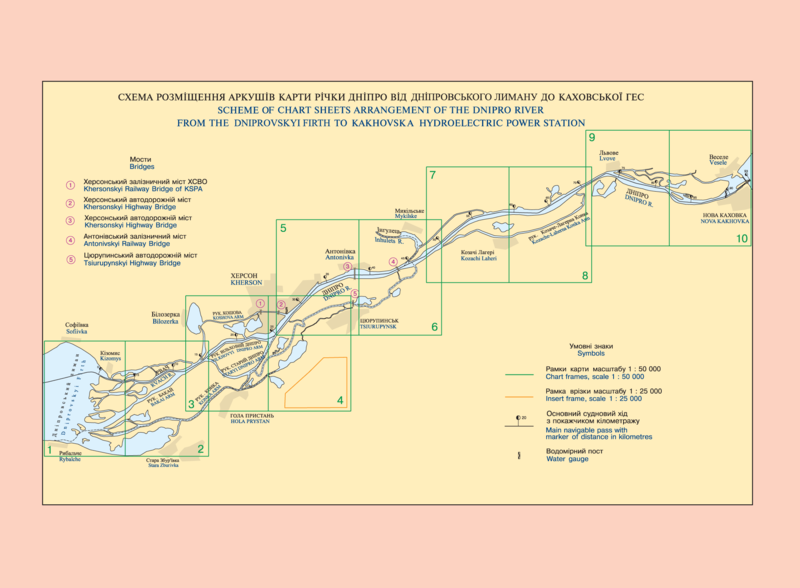 Kamianske Reservoir from Kremenchutska Hydroelectric Power Station to Seredniodniprovska Hydroelectric Power Station” is the first edition which contains charts and related texts about Kamianske Reservoir. It gives only general overview on navigational conditions within this section of the Dnipro River and that is why cannot be used as an official guidance for navigation. 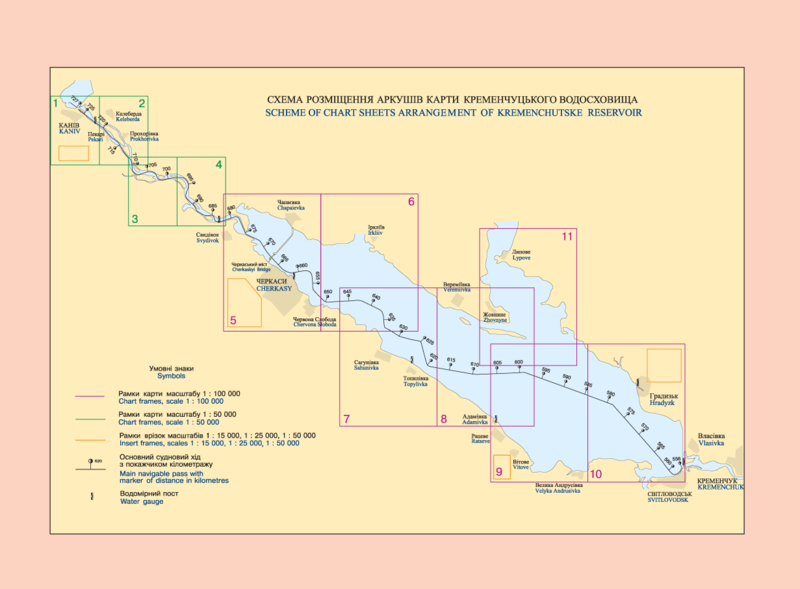 This overview includes the pilot providing physical and geographical, climatic and hydrological characteristics of the Kamianske Reservoir, description of navigational and hydrographic sailing conditions. It also contains 13 chart sheets at a scale of 1:50 000 in WGS-84 supplemented with large-scale inserts, scheme of yacht-clubs and fuel stations location, chart symbols and signal beacons regulating navigation on inland waterways, navigation rules on Kamianske Reservoir, photo illustrations of aids to navigation and river sceneries. For the user’s convenience this publication is compiled in upstream direction from the Dniprodzerzhynskyi Lock to Kremenchutskyi Lock. Kilometres are counted in the same direction along a navigable waterway. Chart sheets are arranged in downstream direction due to chart projection and the direction of river flow relative to chart frames. The overview will be useful for yachtsmen, navigators of small craft, fishermen, tourists and organizations dealing with resources of the Dnipro River. This book is a first edition which contains charts and related texts covering the section of the Dniprovske Reservoir. It gives only general overview on navigation conditions within this section of the Dnipro River and that is why cannot be used as official guidance for navigation. This overview includes the pilot providing physical and geographical, climatic and hydrological characteristics of the Dniprovske Reservoir, description of navigational and hydrographic sailing conditions. It also contains 11 chart sheets at a scale of 1:50 000 in WGS-84 supplemented with large-scale inserts, scheme of yacht-clubs and fuel stations location, chart symbols and signal beacons regulating navigation on inner waterways, navigation rules on Dniprovske Reservoir, photo illustrations of aids to navigation and river sceneries. For the user’s convenience this publication is compiled in upstream direction from the Zaporizkyi Lock to Dniprodzerzhynskyi Lock. Kilometres are counted in the same direction along a navigable waterway. Chart sheets are arranged in downstream direction due to chart projection and the direction of river flow relative to chart frames. 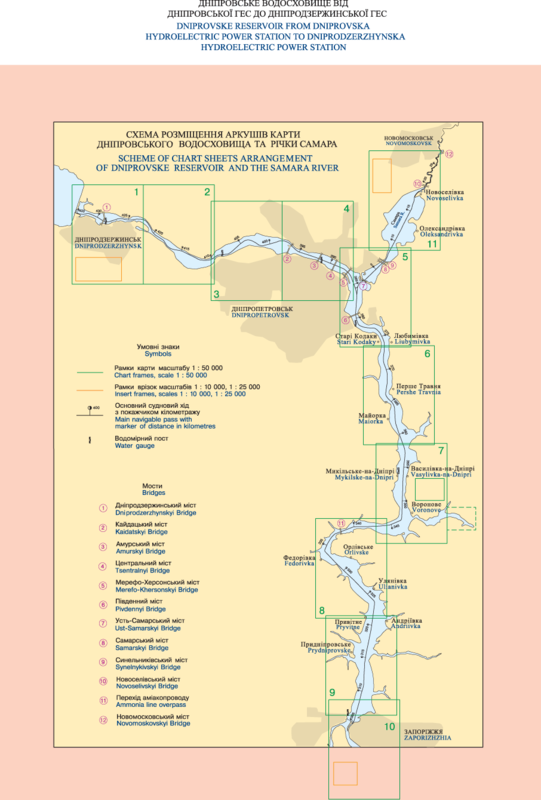 This book is a first edition which contains charts and related texts covering the section of the Kakhovske Reservoir. It gives only general overview on navigation conditions within this section of the Dnipro River and that is why cannot be used as official guidance for navigation. 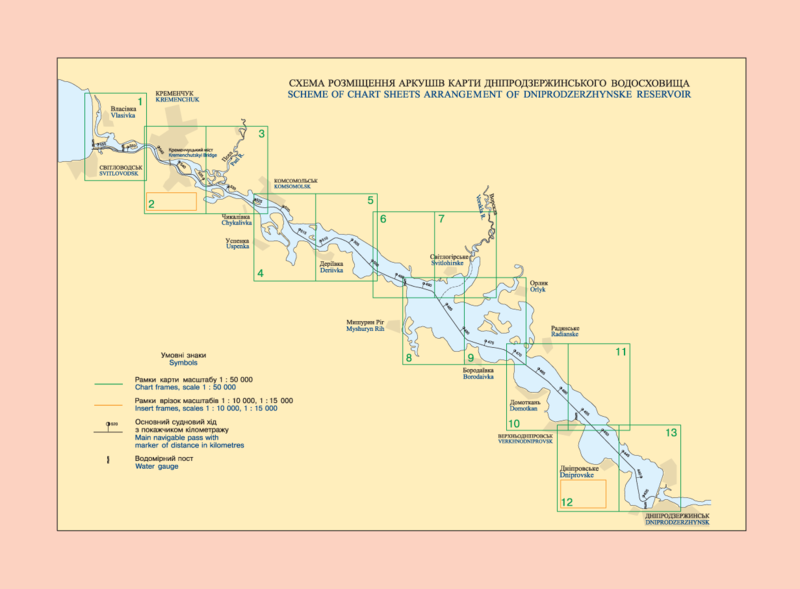 This overview includes the pilot providing physical and geographical, climatic and hydrological characteristics of the Kakhovske Reservoir, description of navigational and hydrographic sailing conditions. It also contains 13 chart sheets at scales of 1:50 000 and 1:100 000 in WGS-84, supplemented with large-scale inserts, scheme of yacht-clubs and fuel stations location, chart symbols and signal beacons regulating navigation on inner waterways, navigation rules on Kakhovske Reservoir, photo illustrations of aids to navigation and river sceneries. For the user’s convenience this publication is compiled in upstream direction from the Kakhovskyi Lock to Zaporizkyi Lock. Kilometres are counted in the same direction along a navigable waterway. Chart sheets are arranged in downstream direction due to chart projection and the direction of river flow relative to chart frames. This book is a first edition which contains charts and related texts covering the section of the Nyzhnii Dnipro River. It gives only general overview on navigation conditions within this section of the Dnipro River and that is why cannot be used as official guidance for navigation. This overview includes the pilot providing physical and geographical, climatic and hydrological characteristics of the Nyzhnii Dnipro River from Mouth to Kakhovska Hydroelectric Power Station, describing navigational and hydrographic sailing conditions. It also contains 10 chart sheets at a scale of 1:50 000 in WGS-84, including the insert of Kherson Port at a scale of 1:25 000, scheme of yacht-clubs and fuel stations location, chart symbols and signal beacons regulating navigation on inner waterways, navigation rules on navigable arms of the Nyzhnii Dnipro River, pictures of aids to navigation and river sceneries. For the user’s convenience this publication begins with the Dniprovskyi Firth to the Kakhovska Hydroelectric Power Station. Kilometres are measured in the same direction along a navigable waterway; chart sheets are arranged in the same way. The starting point (kilometre zero) is marked in the chart at the entrance to the Rvach River. Bridges are charted from the Upper Dnipro River.